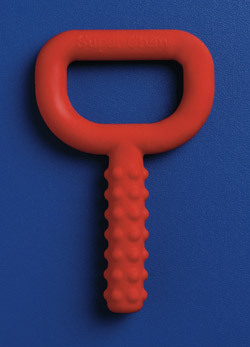 The Red Super Chew offers a solid yet knobby surface for practicing biting and chewing skills. Little bumps surround the entire bitable stem offering lots of fun tactile input for the mouth. 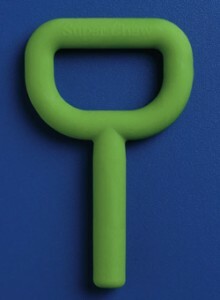 The closed loop handle is easily grasped by little fingers. The Red Super Chew features a stem size of 9/16″ outside diameter. The Green Super Chew offers a solid and smooth surface for practicing biting and chewing skills. If a child demonstrates oral defensiveness or sensitivity to touch and textures, the smooth bitable stem of the green Super Chew may be more readily accepted than the Red Super Chew. The closed loop handle is easily grasped by little fingers. The Green Super Chew features a bitable stem size of 1/2″ outside diameter.